Chicago is famous for food like Pizza, Hot Dogs and Italian Beef Sandwiches, however one of the things I missed right away after I moved west was Pork Roast with Bread Dumplings. 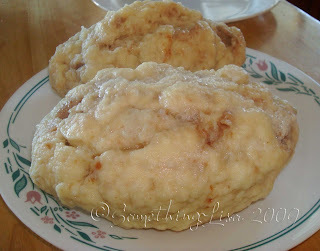 Bread dumplings were readily available in the freezer section back home but not out west. 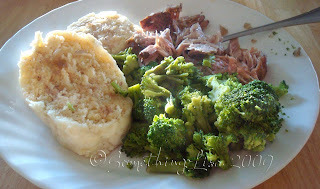 I wondered what people ate with pork roast if they didn't have bread dumplings. Fortunately my Grandmother gave me an easy recipe that I am going to pass along to you today. some flour, eggs, milk, baking powder, salt and parsley. I was out of parsley so I left it out. After mixing it all together with a spoon you divide the dough into two balls. I always roll these two balls into loaf shapes as it is easier for them to cook evenly. The dough then sits for an hour or so (I actually often cover mine loosely with plastic wrap and stick it in the fridge for a couple hours so that I can take a nap before dinner). 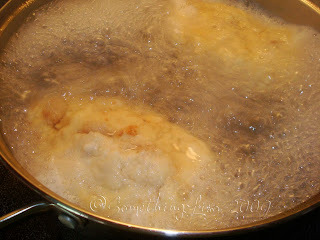 The next step is to boil a big pot of water (about 4 or 5 inches deep) and put in the dough. You will boil it for 10 minutes on each side. And here are the ugly breads. I think they look like pale brains but the taste wonderful. Pour pork gravy (aka pork grease) over the top for a yummy addition to your pork roast dinner. Put dry ingredients into bowl and stir to combine. Put milk and eggs into another bowl and lightly whisk together. 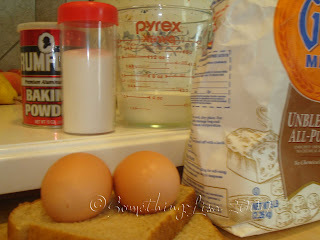 Add dry ingredients and bread to wet ingredients and mix together until well blended. Divide the dough into halves and roll lightly in flour. Set dough aside for one hour. Cook in boiling water for 10 minutes on each side. Slice and serve with gravy. Adding two slices of bread is totally unexpected. It sounds yummy. 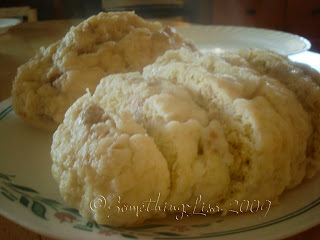 Love bread dumplings and, fortunately, I don't have to make them. Josie's dumplings is right here on Pershing Road and they have lots of wonderful Czech foods in their freezer case. Wonder why the two slices of bread? I agree what else do you eat with a pork roast?